Technology is an indispensable tool for many businesses. However, as much as these techniques help us out a big deal, they are not always perfect. In business, processes are linked to each other in one way or another. Having programs for every process is easy since it gives the user a sense of automation, but getting these programs to work together to streamline the business’ operations can be quite a hustle. Business Process Automation (BPA) is a systemized method in the form of software whose aim is to take redundant, complex tasks and streamline them into hands-free processes. In other words, BPA makes use of technology to make your operations run smoother and without much supervision. 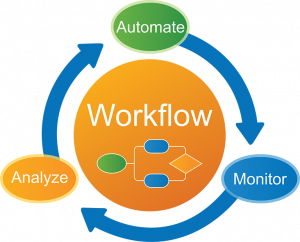 So, how does business process automation come into play for your organization? Here are some of the uses of BPM. In the initial stages of starting a business, managing clients is not as hard. This is apparent because the business is yet to have as many clients and the processes are limited. However, as the company expands, and you take on more clients, managing their accounts can be a nightmare. Since losing clients because of dropping the ball on accounts is not an option, BPA software is the best bet. By adding a BPA software to the mix, you not only ensure that the clients are upraised of your progress on projects, but it also fosters an air of transparency and accountability on the side of the business. Using a single business automation software might work for the specific process, but it leaves other processes vulnerable to inefficiency and mistakes that come with human involvement. Therefore, a business is encouraged to create an ecosystem of all the major business processes in the organization so that operations are well monitored and streamlined. Marketing and customer support are a foundational pillar of business. If left neglected, the business will suffer in more ways than one. One such instance where BPA can be used in marketing is removing the process where you must post on different social media platforms one at a time. A BPA software can ensure that when an article is posted to the company blog, the same is replicated on Facebook, Google +, Twitter and LinkedIn. BPAs can also automate the process of handing clients’ tickets and following up to ensure every customer was served well and to their satisfaction. Responsibility at the workplace is crucial. Without ways to enforce accountability, things will go astray in the business, and no one will be liable. However, when it comes to BPA software, initiations, rejections, approvals and outbound tasks are all tied to a member who is supposed to perform the specific action. By doing so, the business ensures transparency and accountability for all the stakeholders. It allows managers to learn about the processes that take the longest and who to question for follow up scenarios. Man is to error. Such errors can cost the business a lot of money. By getting rid of mistakes caused by man from the equation and substituting them with the accuracy of a machine, you save yourself and the business time and money rectifying the errors. Inefficiencies caused by human nature include slow sales approvals, late payments, and even paying for goods that weren’t received. By automating these processes using BPA software, you will not only cut on these errors but also remove them entirely from your business. At Pyrumas, we understand what it takes to run your business properly. We design and develop BPA software that is tailored to the needs of your business. Minimize errors and inefficiencies from your business today with our software.